July 28, 2010 ? Hattiesburg, MS . . . The typical wet, humid heat of the Deep South greeted drum corps fans to this year?s show at the University of Southern Mississippi?s M.M. Roberts Stadium. This was my first trip to this venue and I thought the stadium lent itself well to the drum corps experience. The acoustics were absolutely stunning. Both end zones are open, while the stands rise high on both sides of the field. Some of the corps even took advantage of the open end zones, but we?ll get to that in a bit. The crowd settled in early for what proved to be a full night of entertainment. The first corps of the night was Teal Sound. Because I am a pretty big fan of Dream Theater, I was very interested in just how this style of music would sound as a field piece. Being an old battery guy, the first thing that caught my eye was the cymbal line and the fact they were fielding China-type cymbals that added that ?special? tone that the percussionists always like. It definitely brought to mind the progressive rock flavors of Mike Portnoy and his unique style of playing. Throughout the show, the crowd was treated to tuba features, an array of flag colors adding to the drama of the distinctive style and sound of the music, complex drill design and even a guitar and bass player in the pit. One of the catchier drill moves of the night was a huge rotating circle of horns at mid-field. I think it?s safe to say, Teal Sound has proven it will be a driving, innovative force for the rest of the World Class corps to watch! For a long time, many in this activity have frowned on pop/rock music within the World Class ranks. Teal Sound has proven that genre is worthy of our beloved activity. Pacific Crest showed the crowd how much life can twist and turn with their current program, ?Maze.? This show began with a collapsing drill from the sides into the center, as well as a mini-snare feature in the opener. Again, in the second number, Asphalt Cocktail began with a very affective decrescendo from the battery, leading right into the horns. I was very pleased with the trumpet and tenor duet in the third number, Sam?s Gone. The closer was flavored with lots of four-mallet work from the pit, as well as the guard employing gold streamers/scarves. At one point, the guard used these to make squares within the drill, providing a pretty cool affect and setting up the climax of the program. Always the percussionist, I was pleased to hear some very tasteful djembé work from the right side of the pit. The highs and lows of that very unique drum were utilized to set the mood. In addition, the same member very affectively employed the cymbals around his drum kit to add even more color. There?s a word: color! There seemed to be no shortage of color in the guard. While the entire group used fuchsia-colored flags with a yellow stripe to set the mood, a lone flag colored exactly the opposite of the rest symbolized a lone escapee. All this made for quite the climactic ending. The Mandarins are obviously determined to prove they are in the World Class ranking to stay. Their current effort is no exception and they did exactly that. This journey began with a drill set with a Turkish-styled star at mid-field. Adding to that dynamic was the use of tambourines from the pit. At many points throughout the show the pit was utilized to give the obvious Middle Eastern flavor to the entire program. he snare line added their two cents worth with some very clean five- and six-stroke rolls. During a battery feature, the guard employed a very tasteful use of color with red netting, followed by the horn line re-entering the phrasing in a big way. This was a nice job by the entire horn line and the crowd took notice of the big horn sound. In contrast, the pit showed their versatile skills by ending the number with a dramatic gong strike. In starting the closer, the snare line showcased themselves, followed by the tenors and bass line sharing some sixes down their respective lines, followed by the baritone?s intro to the tubas, then to the upper brass. All this and a very busy drill culminated with a large star at mid-field by the horn line. Such ethnically-themed music demonstrates that the Mandarins have not only matured in a big way since entering World Class, but they are proving they have a lot to contribute. It is obvious to me, the Mandarins are here to stay. The Academy is another corps that has been forced to prove themselves over the last few seasons. Since entering into their present class, the corps has continually upped the ante, musically speaking. There were many striking moments (no pun intended, drummers) in the first moments of the show. The first of which was a very impressive set of triple stroke rolls from the snares, followed very soon after by a dramatic horn crescendo, started this show off with quite a few, ?wows? from the crowd. Since esthetics are important, I?ll take time to mention the very alluring appearance of the guard. At one point in the second number, a large portion of the horn line lifts a single female guard member up in a moment of adoration. I even heard one young male audience member say out loud, ?I don?t blame you. I?d worship her, too.? Very quickly the guard changed uniforms from red and black to purple, contributing to the already building drama. The cymbal line?s very tasteful visuals did not go unnoticed. A pleasant surprise was enjoyed when the concert number was performed sans battery. Talk about eliciting emotion and drama. After many years of use, the ?curtain? on the sideline is common place. However, when they?re set up sporadically about the field, they still beg the question, ?I wonder . . .?? The about face in color schemes added to the overall effect. And, as one would expect, the change was accomplished behind these elaborately-colored screens. One of the more dramatic drill moves of the entire night was at the end of this show. I thoroughly enjoyed the huge triangles of horns on the left and right, while the battery was stacked at mid-field that finished The Academy?s show. There were lots of changing dynamics, colors to stir the senses and thought-provoking drill. As I said before, these kids are continually improving their craft; making the statement, ?We are here and we?re not leaving.? The Colts came next with their explosion of color. The guard spread from seven yard line to seven yard line made me take notice, saying to myself, ?What are they gonna do?? These guys never fail to surprise me with their show. This year was no exception. The next WOW moment came when the horn line accomplished a very staccato phrase led by the trumpets. Obviously, color is the word of the summer for the Colts. The guard took no exception to this rule as green rifles, sabers and flags abounded. The horn line even got into the act with green scarves on their epaulets. The second number, Alone in a Crowd, began with random blue horns, drums and all-blue guard tools. I was pleased by one particular move I haven?t seen before (which are few and far between in this day and time) where a lone guard member performed a routine of sorts with a single cymbal. That was followed by one guard member throwing a quad with a rifle and a different guard member catching it (an oldie but a goody!) that got more than a few reactions from my section of the stands. All the blue on the field very aptly contributed to the ?Alone? theme. The next number began with a pit feature with ALL the keys nimbly performing their piece with four mallets. Trumpet duets, mellophones features, a solo of very smooth sixes up and down the bass drum line, along with a drum feature working into a big horn front for an equally big sound worked in concert (of course) to show how these kids from the heartland of America put their heart into their show every year. After reading prior reviews from Drum Corps Planet, I was very anxious to see exactly what the Troopers had to offer. The topic of new uniforms has been quite the buzz of the summer and they did not disappoint. On the other hand, I must admit I was more than a bit curious to see how Bon Jovi blended with Aaron Copland. I loved the drum finish. Blue? Who woulda thunk it?! This show was full of visuals from its very beginning. Horns falling in wave fashion . . . I can?t help but think, ?Would THAT have hurt 25 years ago?? Nonetheless, I thought Wanted: Dead or Alive was hugely successful. We never know what to expect from how some popular music will sound when adapted to the field. I was very pleased by the next graphic surprise, one-half of the guard in solid white, while the other half was in solid Trooper blue. I couldn?t help but notice the ubiquitous Western flavoring that is the Troopers? trademark in each number as the show progressed. Not often are you treated to staccato sections from the tubas, but as always, these guys plowed new ground. Trooper fans were not disappointed with this show. 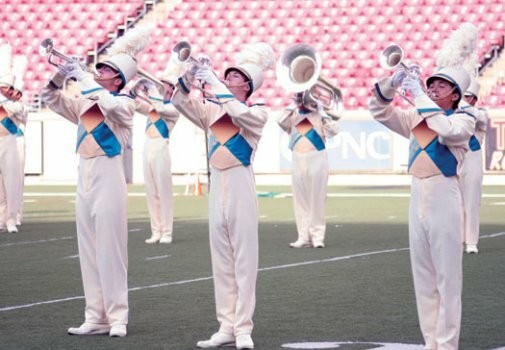 Their selections had the usual big drum/horn finishes we associate with a Casper show — constantly evolving and rarely stopping drill, and the call and answer phrasing between the upper and lower brass. All of this culminated with the ?outlaw? drum major being ?taken in? by the ?femme fatale? guard member . . . and with his own gun, too. I?ve been a Troopers fan since around 1980. They are one of the few remaining old school corps that has the tenacity to stick around, as well as continue to be a crowd favorite. This was more than evident from the standing ovation they received in Hattiesburg. Can you say perennial crowd favorite? Next up was the Glassmen. More than one corps has adopted a spiritual theme this year, including the Toledo, OH, corps. The very graphic uniforms were the first thing to catch my eye and I dug the new drum finish. I didn?t get to see the Glassmen last season, so I was very interested to see how they had shaped up since 2008. By the looks of their repertoire, they had their work cut out for them. Do the names Elias, Glass or Berry ring any bells? The word dramatic doesn?t seem to carry enough emphasis when describing this year?s Glassmen show. One of my favorite moves came in the second number where the horn line had worked its way to the backfield, then suddenly transitioned to the front with the upper brass on their knees and the lower brass playing over the top of their heads. In the next number, I was impressed by the battery?s obvious agility. These guys were literally running from drill set to drill set. At one point, the horn line formed a large ?T? that the battery scurried to the front of. All of this, combined with some thought provoking dynamics and accents from the snares and tenors, lent itself quite well to the already dramatic theme of the show. Moreover, the guard uniforms of blue, coupled with their use of a heavenly gold-colored flags provided some appropriate displays of color. Also in the closer, I was impressed by the snare lines? clean double stroke rolls and considerable stick heights. While this might not be uncommon, it is still an accomplishment with eight snares. To finish their show, I thought the final drill set of what appeared to be a crown (get it, crown of heaven?) was a very apropos way to end the production. I thoroughly enjoyed this show due to it?s ability to invoke God?s help in our everyday lives. When Phantom?s pit began setting up, the buzz through the stands was undeniable. Everybody knew we were in for another whiz-bang Regiment show. Then, when the drum line entered the field, it was unanimous in the stands, ?Where is the horn line?? After what seemed like several minutes (it wasn?t), suddenly the horn line came running onto the field from the left front side. Now we?re talking drama! Adding to that drama, the solid white uniforms with silver accents were nicely complemented by the purple guard uniforms. As is customary with a Phantom show, horn phrasing led to drum phrasing, which led to keyboard phrasing throughout the singular piece. The premier soloist of the night was a flugelhorn player who was showcased from the right side of the field throughout the show. In the first battery feature, buzz rolls gave way to an all-drum fest, which in turn worked into a decrescendo from the battery into a tasteful keyboard feature. More dynamics were utilized as the horn line turned to the rear, building into a big, loud horn finish. Voluminous hi?s and lows seemed to be the order of the night for the Phantom Regiment. But, then, isn?t that always the way with that group of kids? I recall seeing them for the first time in 1982 doing their first version of ?Spartacus.? Loud? With two-valved horns? Seriously . . . yeah, it was loud and it was awesome. Loudness is something we?ve come to expect from them, on the whole. But I suppose it?s no small wonder when you field 12 tubas! Phantom employed what I thought was the most effective use of dynamics of the night. All sections contributed to this effort and it paid off in a big, typically Phantom way! The perennial drum corps powerhouse and ever-popular fan favorite Cadets (I still tend to call them Garfield) was the next corps up. Ever the innovators, I was more than a little intrigued by the toy soldier trumpets. I don?t always get to stay up to speed with DCW or Drum Corps Planet reading the reviews, so I have to confess I was taken by surprise when they appeared on the field. Again, the always innovative Cadets pulled one out the hat by their intro of the rest of the corps. My next surprise was in seeing the entire corps outfitted in exactly the same uniform. I knew something else was in store, particularly from the guard. I just didn?t know what. In a matter of a few minutes, I found out it was pink. I was very pleased to see that in the most technically advanced age of drum corps to date and, while all the rage seems to be amplification and electronics, at least one corps still has a sense of humor! This could not have been more aptly illustrated than by the ?winder? mechanism brought into play by the main character. I knew when I saw the winder, then heard the ratchet from the pit, I was in store for a good, old-fashioned, entertaining drum corps show. In the midst of said entertainment, I rather enjoyed the gradual dressing down of the guard into their pink tops. Simplicity always seems to work, even in drum corps. Musically speaking, I was very impressed by the snares and tenors? flams leading into a horn front that spanned most of the field. Not long after, another big horn front with the battery behind was reminiscent of my favorite drum corps era, the 1980s. All the while our main character continued with his theatrics and comedic presence. This show spotlighted the pit and allowed those members to contribute in a major way to the music, and even more so to the overall general effect. Shakers, tambourines and the aforementioned ratchet, among others, granted our toy soldier?s life. I was even more impressed when the little boy displayed his obvious talent with a saber. This Cadets show was, without a doubt, the most entertaining I?ve seen in some time! There has been quite a bit of buzz regarding the new uniforms of Carolina Crown. What caught my eye the most? When was the last time any of us saw gold horns on the field?! Did I mention I marched in the early 1980s? Would I ever love to have a second chance at that. I was taken by the brush work on the snares and the quite dramatic effect it created. Soon after, the battery shared what I called a ?mini-feature? with the trumpets while the rest of the horn line lay down on the backfield 50 yard line. During the third number, a decidedly Latin-flavored ?Danzon? by Arturo Marquez, the snares added to the Latin feel with a clavé effect from the drum sticks themselves. Ordinarily, you?d expect to hear this from the pit. I rather enjoyed this effect and it having been put to use in such a fashion. Speaking of the pit, a change on the tympani to a soft mallet created yet another dramatic effect. More retro drill sets! The 10 yard line to 10 yard line spread of horns reminded me (and quite pleasantly, too) of some of the old 27th Lancers and Bridgemen moves. As if that weren?t enough, that HUGE horn front was worked into an even bigger X at mid-field for the end of the closer. Crown is yet another corps that has proven in the last several years that they mean business and is destined for the coveted top spot at finals. The race is on, drum corps fans. These kids are determined and are going to entertain you in the process. Jazz? Stan Kenton? Blended with classical music? The Blue Devils? Yes, but of course. Would we have it any other way? Wouldn?t we all be surprised if it weren?t so? Even more impressive was the use of a djembé to start the show. I?ve played a djembé extensively for years in live settings, but I never would have thought to use it in a jazz context. I wish I could get tones like that out of mine! Then there was the powerhouse, signature battery for which the Blue Devils have come to be known. Classic double stops built into another famous Concord trait, a loud horn finish. A plethora of colors greeted the eye with the guard. Always changing and evolving, one never knows what is coming next from their guard. A very busy and unique drill had the horns literally running to the next set. I thoroughly enjoyed a Kenton-esque trumpet solo with some well-practiced brush work from the percussionist on the drum kit. This guy was all over the pit: djembé, drum kit, mallets. I have a new hero. Moreover, a drum feature toward the end of the program showcased the drum kit a second time. Blending the drum kit with the battery is an effect we don?t get to see very often and it was done very smoothly. Scott Johnson and his guys do it again. This Blue Devils horn line is one of the more articulate in recent memory and they are showmen (and women) down to the very last note of the show. All these factors combine to make it no big surprise why these kids are leading the pack again this year. The word ?favorite? doesn?t seem adequate in describing the corps that has seemingly become the overwhelming choice when the question is posed, Who is your favorite corps? The highlight of this drum corps show was getting to spend a little time with some people I spent many rehearsal camps, days and nights riding a bus and marching with: alumni of the Memphis Blues Brass Band: a Drum & Bugle Corps. Most of these folks I hadn?t seen since late November, 1982, at the annual banquet. Members of all sections were present: drum line, color guard and horn line. Many of these folks hadn?t been brought together since tour ended those many years ago. This mini-reunion was made much simpler by utilizing each of our FaceBook accounts. Here?s to MB3: you can?t help falling in love! Posted by DCP Publisher on Friday, August 13th, 2010. Filed under DCW On-Line.